Dan Marshall set out to make a game based off a single tweet, where he admitted to having very little knowledge of how soccer is played and, frankly, not caring to learn. The result of that exercise is Behold The Kickmen (on Steam for $4), an irreverent caricature of soccer that somehow makes the full loop around to being one of the most accidentally excellent takes on the virtual pitch. It’s clear from the outset that this isn’t your normal game of soccer—the pitch is circular, for one, and pretty big too. A tutorial starts to teach you the basics, but it’s also laden with unnecessary facts and tidbits about the in-universe lore of soccer, all blocking view of the actual field of play. It’s an up-front way of saying the game isn’t going to play by the established rules. Goals in Kickmen gain points based on how far away you booted them from, and players can side-dash to dodge incoming tacklers. An offsides isn’t a rule so much as a warning, as half the arena will light up at any time and any ball carrier within that side will be red-carded if they haven’t vacated within a few seconds. There aren’t many defined systems at play here. In sports games, you usually experience a myriad of mechanics when a play happens. Recent Madden games have you pressing buttons to change your receivers’ approach to catches, while FIFA has all sorts of formations and player stats. Kickmen doesn’t even do corner kicks, and penalties only happen in rare circumstances (i.e. tackling a non-carrier for no apparent reason). Your tools are passing, kicking, tackling, sprinting, and the aforementioned dashing. What you make of that is up to you, because frankly, there’s little in the way of formations (outside a drag-and-drop 4-4-2 setup) and real plays. Most matches play out like a pick-up game at the park, only on a giant field and with thousands of spectators throwing cash at you. The campaign is where Marshall pokes some fun at institutions like the Premier League and, well, soccer in general. A newcomer from a grand legacy of soccer, you make your team of rookies and train them up to compete in a weekly league. Verbal sparring matches with your rival are interspersed with dialogue choices, and your coach rewards you with a new ability every time you win. You have to actually win a match before your team can learn how to pass, which is surprisingly effective at forcing you to understand the basics before adding on layers. Combining passes, tackles, and dashes builds up a combo meter that gets cashed in with every goal, as passionate fans literally rain money on the scoring team. The richest team in the league will be one that wins with style. 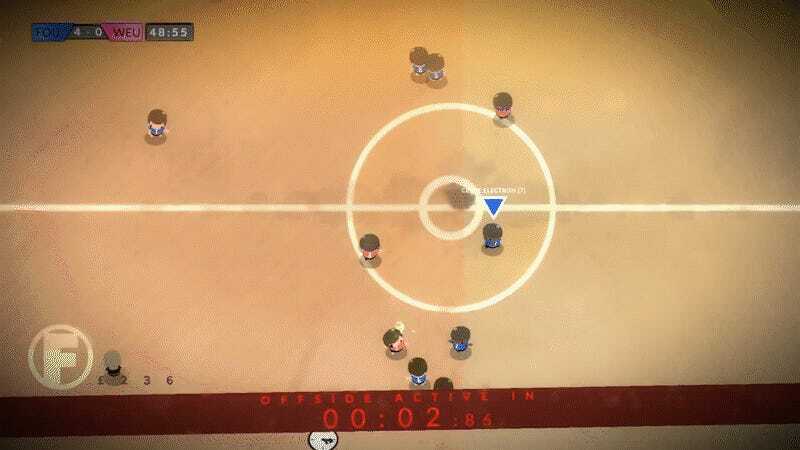 Behold The Kickmen is also only a single-player game, in what seems like another conscious decision to make the game as Not About Soccer as possible. 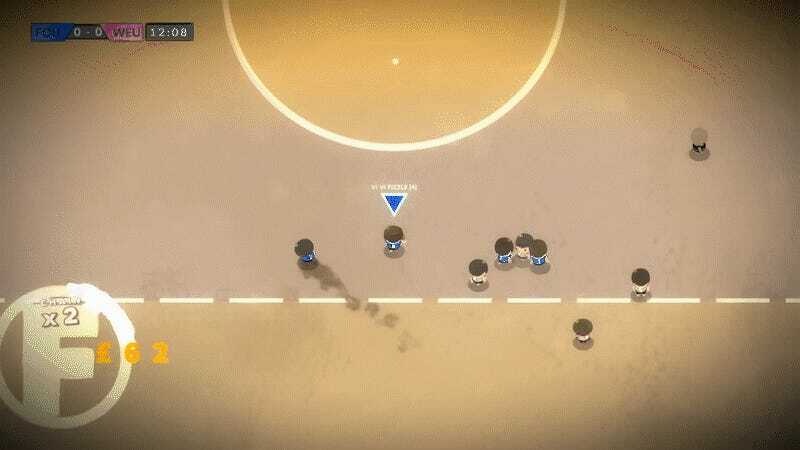 Kickmen is a clever, cheeky, strange interpretation of “the wonderful game” by someone who doesn’t give a damn about making a soccer game, and is all the better for it. Soccer Team Signs FIFA Player, Cuts Him Two Days Later Over "Online Behaviour"